There are five questions you need to answer before you start spending your user acquisition budget. What is my total market opportunity? Who am I competing against? Which geographic region(s) should I target first? What targets should I set to achieve my goal, given my marketing budget? Which keywords should I use to maximize organic discoverability and conversion? You can walk through the process using the presentation embedded below. For many of the steps it will be useful to login to your Priori Data account. If you don't have one yet, get a free account here. You can find any additional information needed for those five steps in the rest of the post. Note: For this workshop, I used the example of a meditation app aimed at promoting 7 minutes of meditation every day. Of course, you could apply this five-step process to any app. 1. What is my total market opportunity? With that information, you can select a list of apps who are - like you - entering the target market and ones that are currently succeeding in it. If you take the total downloads for those apps on a month-by-month basis, you can estimate the total market opportunity: i.e. how many downloads per month are there for apps like mine? That's a good number to start with (and we'll come back to it in point 4) but it's more of a general benchmark than anything else. Now, we need to go deeper. 2. Who am I competing against? This is when we start being able to play around with the stats. I have built a watchlist of targeted apps who are already in my space. This gives a decent overview, but it's good to try a few different looks to understand the market better. From this process I can identify Headspace as the “best in class” and Mind Journey as “best newcomer”. That means, while Headspace might be my ultimate goal, for now I am going to focus on competing with Mind Journey. 3. Which geographic region(s) should I target first? I have both a limited budget of $100k and a limited time span to hit the $500k revenue target. I cannot cover every country in the first 12 months. Let’s look at our top competitors from earlier - what are their top markets? While the Mind Journey country split screen shows USA, China, and Germany. To compete in non-English speaking countries, we'd need budget for the localization process. That's budget we don't have. To cover both our competitors, we’ll stick to the USA. 4. What targets should I set to achieve my goal, given my marketing budget? As you can see from the back-of-envelope calculations I did in the presentation, our $100k mobile user acquisition budget won't take me very far considering the high cost of acquisition (as seen on Chartboost). I could spend my entire marketing budget and only acquire 50% of my target users - in a single month! We cannot hit our download targets with paid user acquisition alone. That means I need to start thinking about App Store Optimization to drive organic installs. 5. Which keywords should I use to maximize organic discoverability and conversion? We can see from looking at Headspace's Keyword Ranking page many of the top keywords for this category. If you then switch to the Keyword Comparison page, you'll see that Mind Journey - our primary competitor for the first 12 months (at least) - has not optimised its keyword strategy compared to the leaders in the market category. There is a clear opportunity for you to steal a march on Mind Journey. That means the next step for you and your team is to focus on getting your App Store Optimization strategy up to scratch. And for that, we have just the thing. 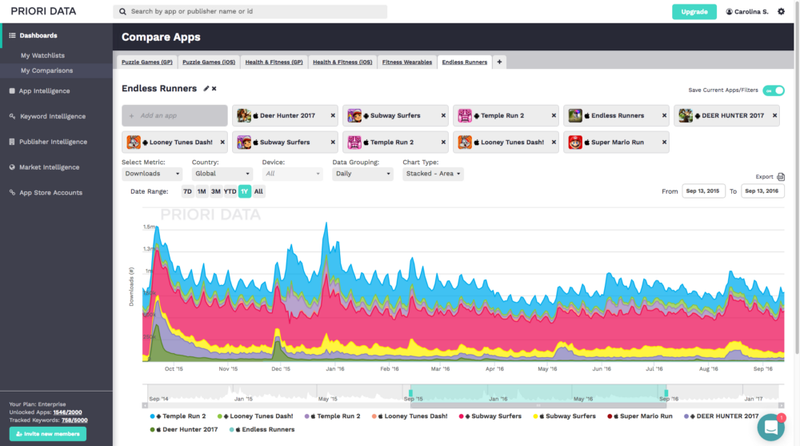 Internally, we refer to this project as “Everything you wanted to know about App Store Optimization, but were too afraid to ask”. ASO is new and fashionable. It is also plagued with a lot of nonsense (like SEO before it) written by people who don’t have any idea what they’re talking about. Priori Data has more than 22,000 app publishers working with us as partners. We know the app market. We know the numbers behind it and we know the people who work in it. We started reaching out to experts in ASO, people who could really tell you what to do, why you should do it and - crucially - what the limitations of ASO are. It isn’t a magic bullet, but it can be incredibly powerful. This guide is a collaboration of our own team of app market specialists and some of the top ASO experts in the field.